For more than 30 years I've been mobilizing volunteers from different companies in Chicago, and matching them with K-12 youth living in the Cabrini-Green neighborhood of Chicago. Using direct mail, the Internet, and social networking strategies, I've been able to keep several hundred of these volunteers connected to us. Some our still volunteers, serving on our board of directors, organizing events, or still tutoring and mentoring at Cabrini Connections, or in similar programs in different places. In the past year I've used Linked in and Facebook to reach out to former students and volunteers, and now we have more than 120 former students and volunteers re-connected to each other, and to us. This is enabling us to learn more about the impact of Cabrini Connections, and enables us to provide continued support. I passed on a resume from a former student to some volunteers this week, which is a tangible example of how this network can support youth and volunteers well into their adult lives. 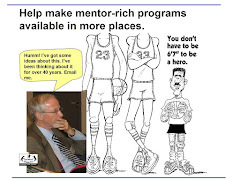 Through the Tutor/Mentor Connection I've connected the programs I've led, and my ideas, to more than 200 similar programs in Chicago and hundreds of others throughout the country. 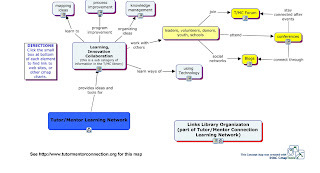 We've connected more than 1500 other resources to these programs through the library of links on our web sites, and the conferences we organize. However, when someone asks me "who are you working with" or "do you work with lawyers, or engineers, etc. ", I've not been able to quickly show who is in my network because it is so large. Thus, it is exciting that Valdas Krebs and Jean Russel are speaking at the November 19 and 20 Tutor/Mentor Leadership and Networking Conference. Valdas is one of the leading authorities on Social Network Analysis, or the mapping of networks, and using this knowledge to accomplish organizational or personal goals. I encourage you to read some of the blog articles Valdas has written, and follow links on his site to others who share his expertise. You can also find ideas on mapping and visualization on our T/MC library. The illustration below illustrates a use of visualization to map resources in our library. While President Obama is calling for a mobilization of volunteers to solve problems in America, he's not yet showing how to build a network of support that would not only make a tutor/mentor program available in a neighborhood with high poverty and poorly performing schools, but would help it be the very best in the world at helping kids expand their networks, and use them to move successfully into schools, college, jobs and careers. 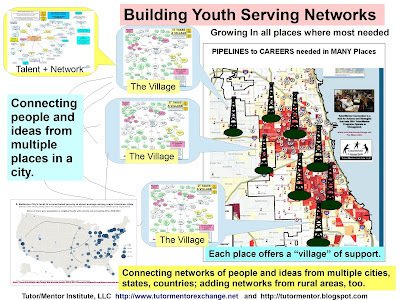 Learning to map and use your network is a skill that can help all of us, and our teens and volunteers. Come to the conference and make the Tutor/Mentor Connection part of your network.